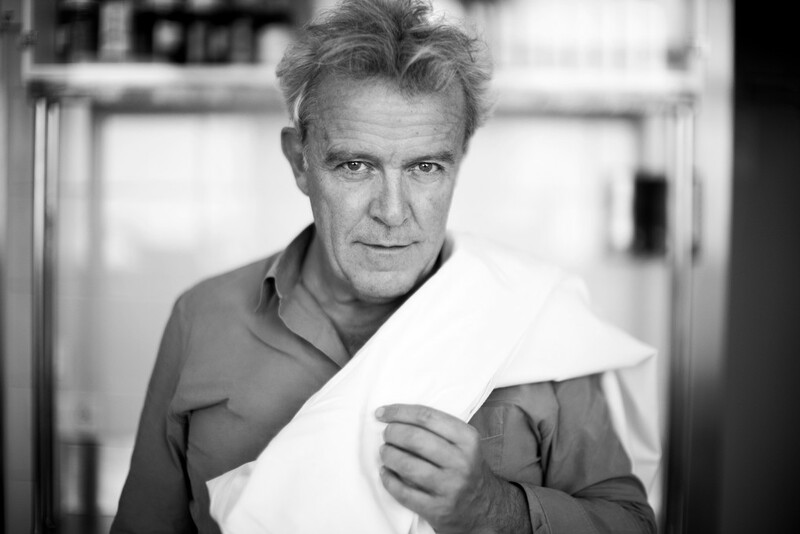 Controversy, innovation, creativity, passion, enthusiasm, all emanate and swirl around the life force that is Alain Passard, Executive Chef and Owner of Paris restaurant L’Arpège. In 2018 L’Arpège landed at No.4 on the Opinionated About Dining Top 100+ European Restaurants list and No. 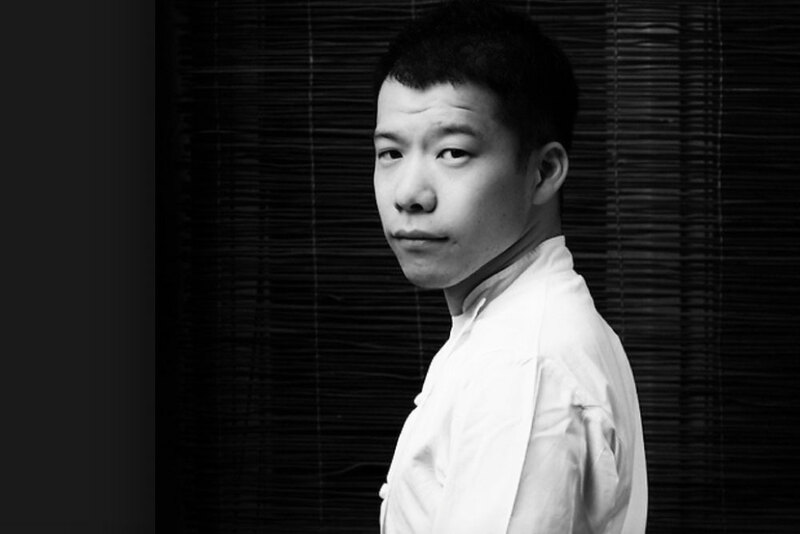 8 in The Worlds 50 Best Restaurants list. I’m here to find out more about Alain, the destination foodie temple he’s created, and to learn if L’Arpège really is french for “exceptional”. L'Arpège .........maybe it's french for "exceptional"
L’Arpège, his restaurant named for the musical reference of the rhythm of notes heard one after the other from the bottom upwards. What a poetic way to describe the feeling of a menu – each ingredient another note in a phrase and each plate another phrase in the rhythm of the composition. 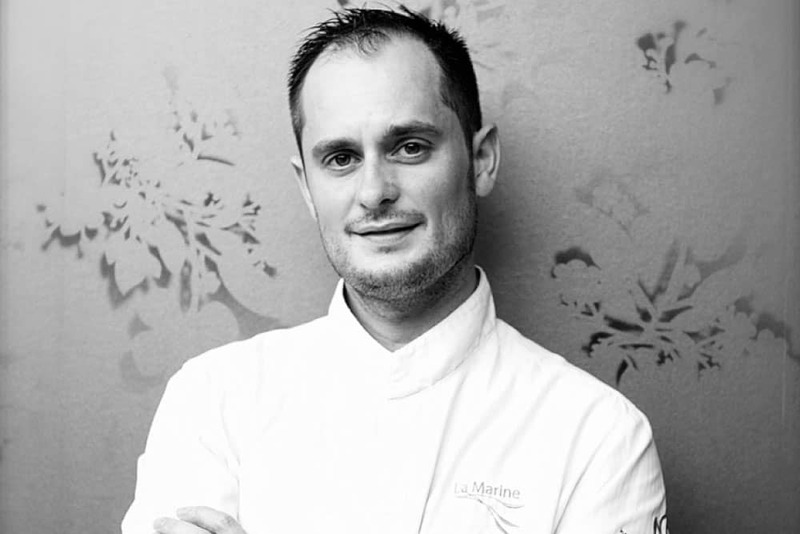 Gault&Millau five toques, Michelin 3 stars, No.17 Worlds 50 Best Restaurants 2017 and No.1. OAD Top 100 European Restaurants 2017. This is a lunch that starts with a huge serving of anticipation and excitement. I am very drawn to Chef Alain Passard’s Story. 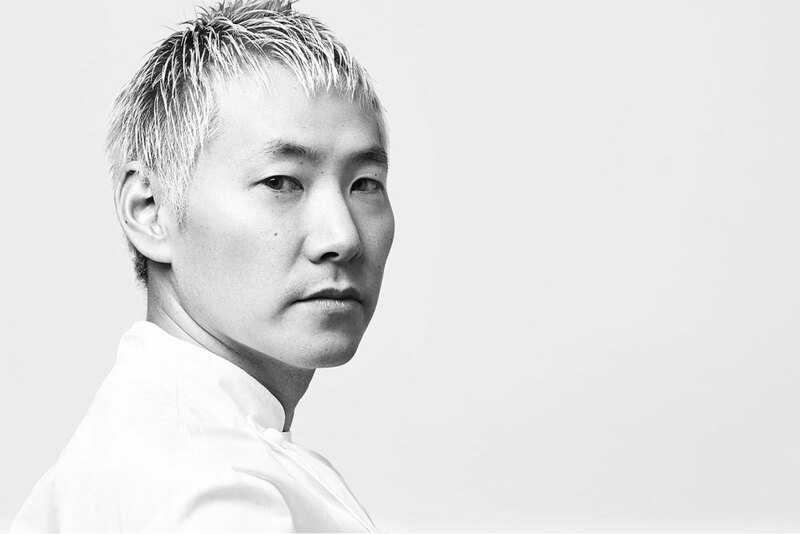 The first twenty years of his career founded in a passion for meat and cooking on an open flame, saw him achieve 3 Michelin Stars. And then at what was at the time, the pinnacle of his career, he simply walked away. Needing space and a break from it all, he found solace in his garden. After a year away he returned, filled with a new enthusiasm and a passion for vegetables. True to his new passion he decisively struck meat completely from his menu. All the dishes that he had earned his stars on were gone! What a brave, madly passionate and honest move to make. 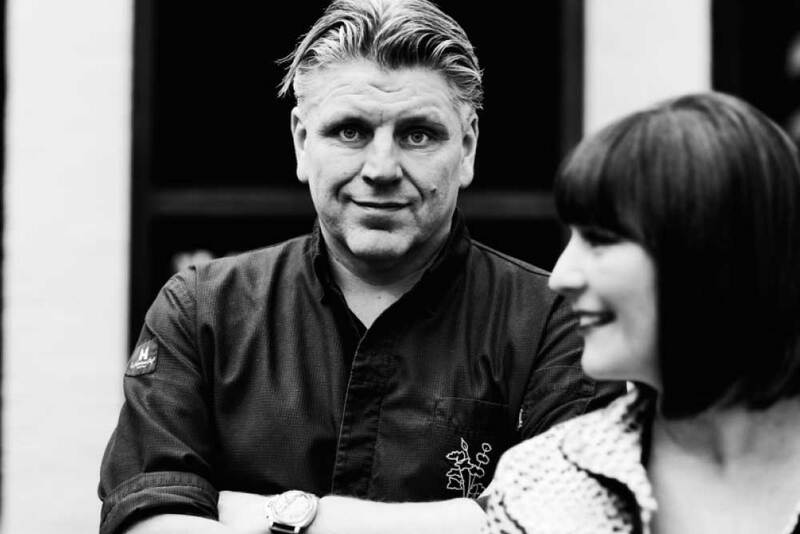 To stand proud and defiant in the face of critics who could not imagine a French restaurant without meat, in order to do what was right for him. That was sixteen years ago and Arpege has not only held its stars but started a movement of vegetable lovers. 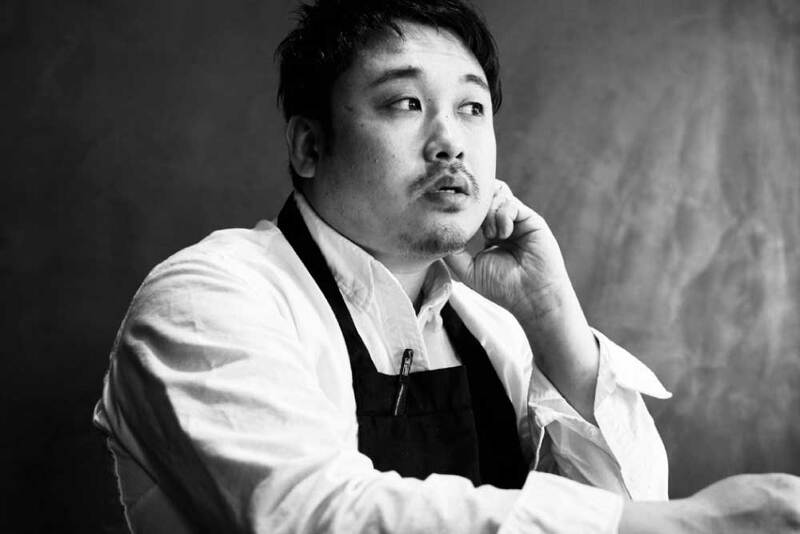 He has softened his resolve a little over time, bringing some meat back onto the menu but it is still very much about honouring the vegetable. His respect for the vegetable and Mother Earth who provides them runs deep. He now has three organic gardens where he grows everything for the restaurant with a great deal of care. The ground tilled with only horse drawn plows, all manner of wildlife welcomed and catered for, to balance the ecosystem and the vegetables he grows only fertilised with love and sunshine. 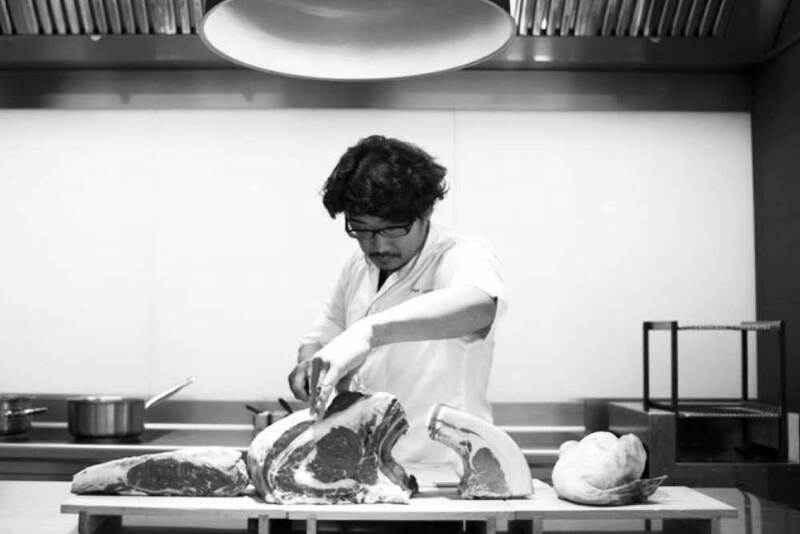 Each day whatever is ready to harvest is rushed to the restaurant with no use of artificial refrigeration and Alain sets to work creating whatever he is inspired to create on the day. He never writes a recipe. I just love the whole idea of that, it must be so invigorating as a chef to be free to create each day and not be bound by the expectation of a fixed menu. The way Alain speaks about how he begins to create, resonates very strongly with me…. And experience a sensatory stroll…..
Our waiter Mark-Antony is tall with a cheeky smile and a strong handshake. 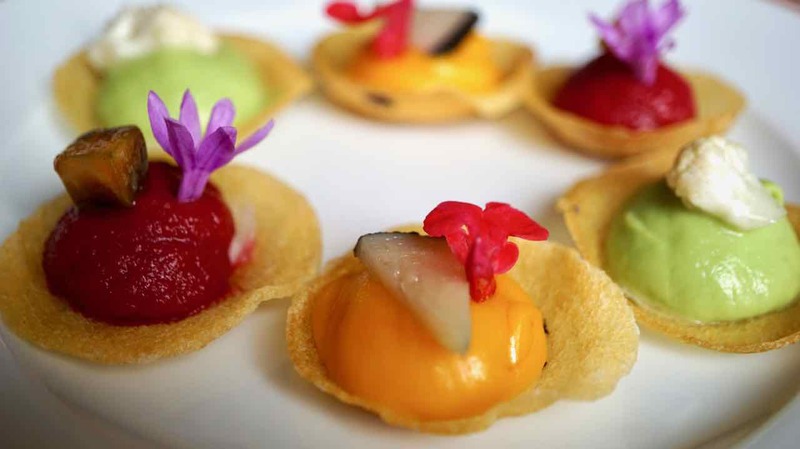 He welcomes us and swiftly brings a welcome treat of a plate of vibrantly coloured little vegetable tarts. Cauliflower and coriander a cheerful green, beetroot a seductive crimson and sweet potato a sunshiny orange. These delicious creamy little bites decorated with flowers and tiny vegetables from the garden are a hint of the palette our artiste du cuisine will be using today. From there the plates flow one after the other at what feels like a perfectly timed rhythm. 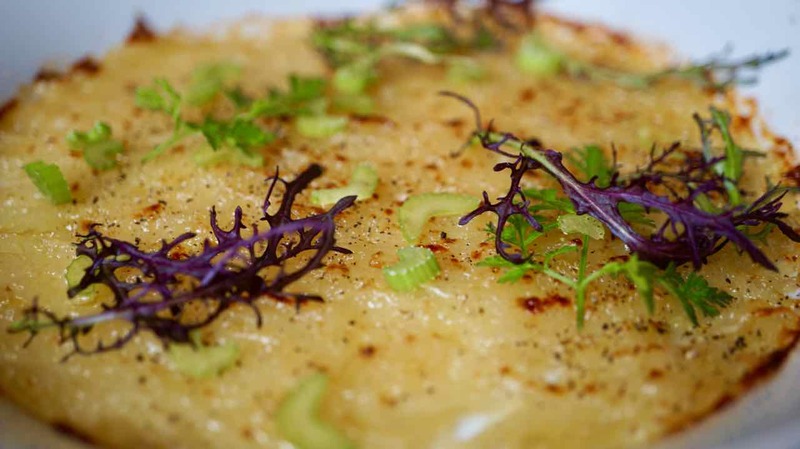 Sweet onions gratin, a thin layer of very finely sliced onion sweetly softened, without much colour other than slight golden hints on top which has a delicate sprinkle of Parmesan cheese. To contrast with the softness of the onion, a few fine slices of crisp baby celery and a few tendrils of frisee. Everything about this plate is simply perfection. Vegetable hummus of pumpkin with a pesto of celery roots and hazelnut. In a perfectly shaped bowl a puddle of smooth pumpkin purée with a generous dollop of the white creamy celery root pesto in the centre again with little flower petals reminding me of the holistic nature of his garden. 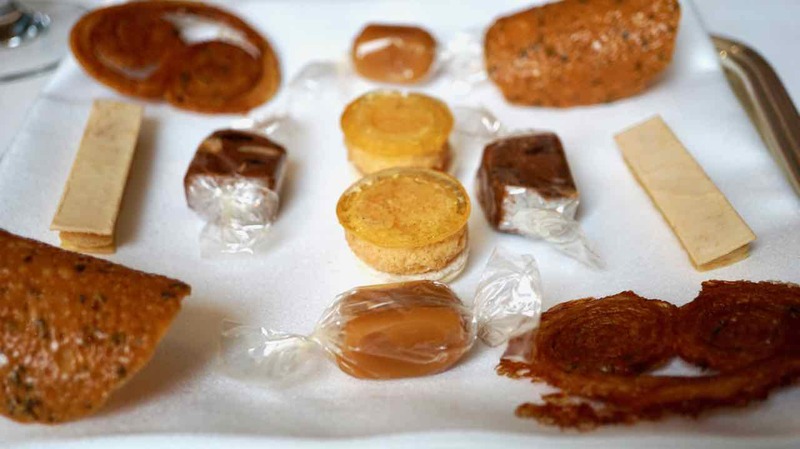 Separately each are filled with flavour but combined they are divine. The delicate hint of hazelnut seems to deepen and bring out the sublet sweetness of the vegetables even more. Ah here it is the famous chaud-froid oeuf (hot cold egg). 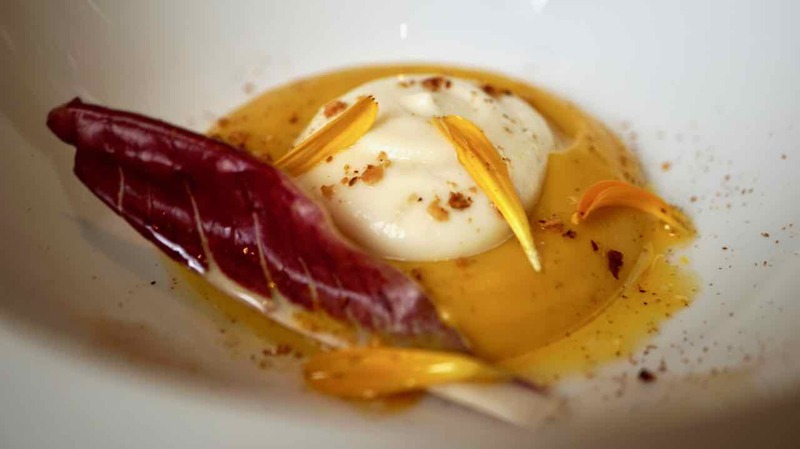 Known as the worlds most exquisite egg, Alain Passard’s magical combination of warm just set egg yolk, topped with cold creme fraiche whipped with aged sherry vinegar and lightly anointed with Canadian maple syrup, Fleur de sel and chives, is truly exquisite! The perfect spoon forces you to be delicate and to take small tastes to truly appreciate the complexity of what at first appears to be a very simple dish. All the senses are tuned in and turned on right here. Visually pretty, the dear little egg in its white egg cup and the flash or rich gold as I break through the yolk. The contrast of hot and cold, the delicate fragrance of the sherry, the texture, at once creamy and light and the flavours, savoury, salty, sour and the final burst of maple sweetness that brings it all together. Ok I’m done, complete and happy. After the perfect egg what more could you want. 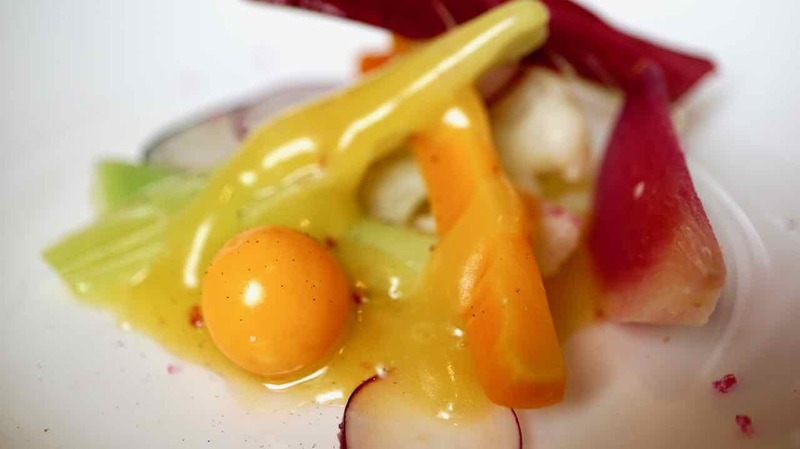 Our next expression of the Passard garden is a selection of vegetables served with a sweet and sour honey sauce. Each of the vegetables is prepared perfectly to show case it at its best. Gently cooked root vege and cauliflower, raw radish sliced paper thin and one or two salad leaves. I can taste the full flavour of each vegetable, they are beautifully sweet. The sauce is quite sour and is a wonderful contrast, working perfectly to amplify the natural sweetness of the vegetables. A little silver bowl with two handles is placed before us. Three little ravioli again the vibrant trio of green, crimson and orange are topped with a pretty pink broth. Mark-Antony tells us the broth is made from sage, turnip, tomato, carrot and coriander. Each of the ravioli has its own very distinctive wonderful flavour, I think I liked the beetroot best, there was something smoky going on there. 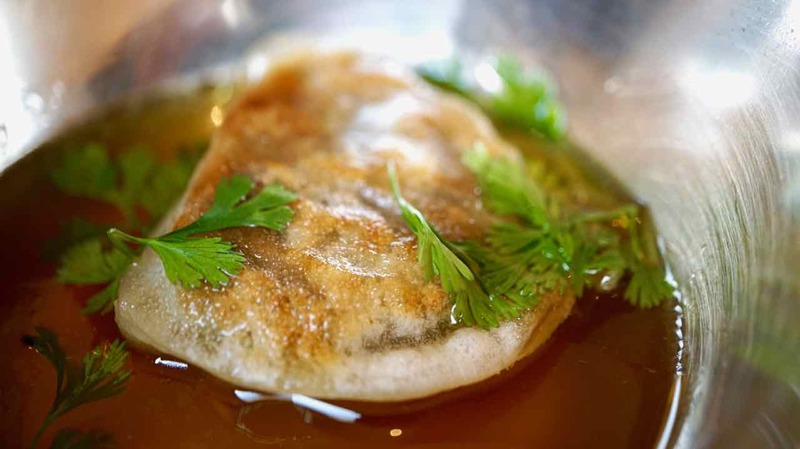 The broth itself was like heaven, filled with many warm sweet layers of flavour. The spoon was tricky as the broth became shallower, we were finding it hard to get the last of it. We couldn’t bare to leave a single drop so with a quick glance around we quickly grabbed the bowl by its two little handles and lifted it to slurp the very last of it. Now sushi of beet, with horseradish and black olive tapenade. A simple but very beautiful plate. Olive tapenade has been swirled around in a super fine flourish barely decorating the plate. 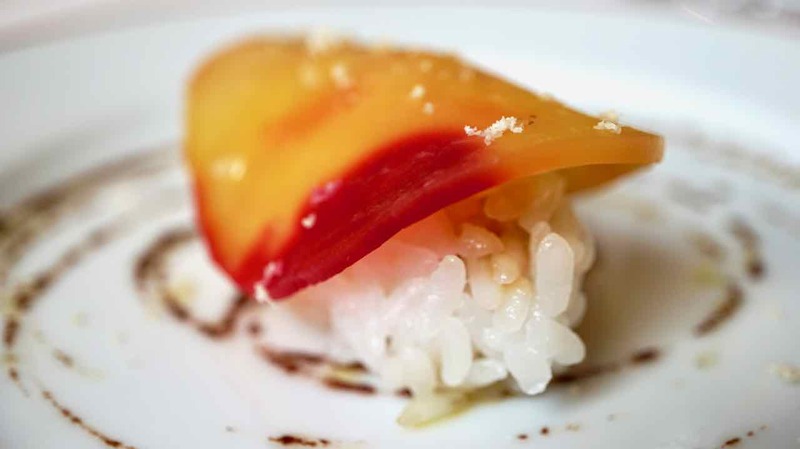 In the centre a small mound of sushi rice has been topped with a thin slice of beetroot. We each have different coloured beets which is fun, one crimson and one golden yellow with a tiny blush of crimson on one edge. So pretty! What amazingly rich flavours, the olive is so bold yet virtually invisible and brings very much a umami note reminiscent of sushi. Our little silver bowl is back for the next dish, this time a pumpkin squash volute another waitress arrives and adds a big scoop of sage cream on top. 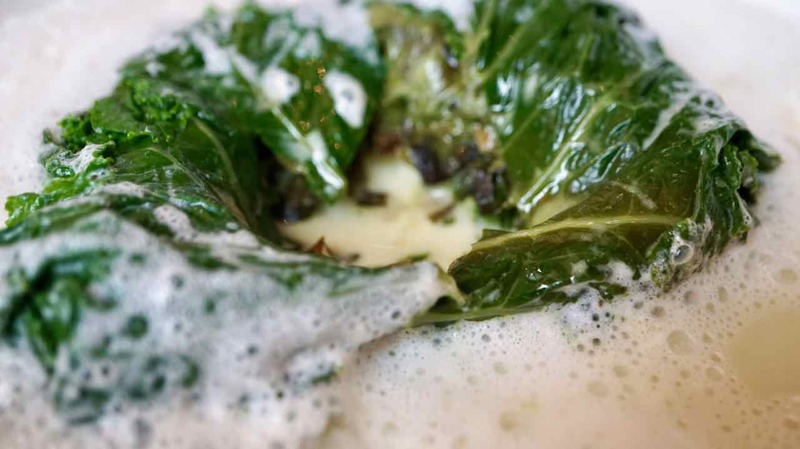 The volute is perfectly smooth and has a lovely earthy flavour, the sage cream is light as a feather, filled with air, creating a delightfully intriguing sensation on the palate. I can see the kitchen a little from where I sit and I am enjoying watching all the different plates come out. The Ballet of the floor staff is flawless choreography as they dance from the kitchen to the table. Head on collision possibilities become near misses as they gracefully swirl around each other at the last minute. I can also see the portrait of Alain’s grandmother Louise hanging right outside the kitchen, her warm gaze seeming to look over the entire restaurant. She was a strong influence in his life and his passion for cooking. He has apparently said he still cannot cook as well as her. I love that he has such a strong relationship with his grandmother. It is something I very much relate to. My grandmother was everything to me growing up. 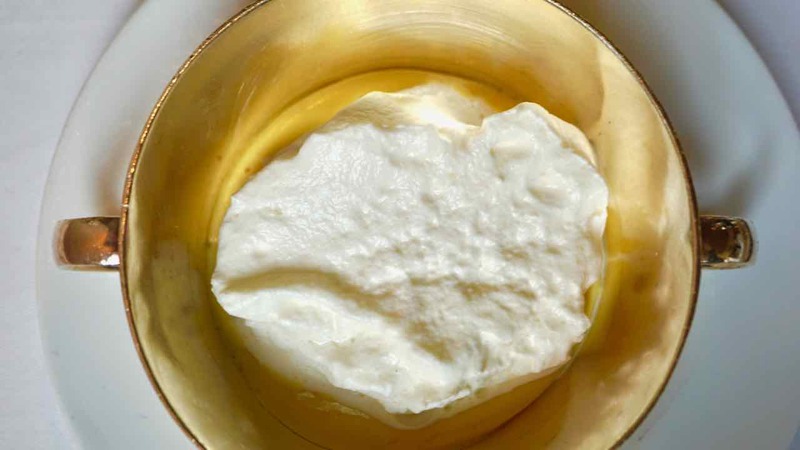 Memories of cooking with my grandmother are my favourite childhood memories. We were very close and she was my first teacher of unconditional love and the first to inspire a fascination with food. Cooking today still transports me and some of the simple things are the ones that move me most. Hers was not a posh kitchen, she often struggled to make ends meet but what she could do with nothing was amazing and nothing was wasted. When we cooked I was allowed to use “the good bowl” her grandmothers bowl. I still have it and Grumpy’s chopping boards. Food still connects me very strongly with my grandmother. Having Alain’s grandmother watch over us today has also brought my grandmothers energy to the table for me. Ah our next plate interrupts my daydreaming. Scallops, this is interesting, as everything is a complete surprise for us we were not sure if our menu would be entirely vegetables or not. Raw scallops, curry, radish and verbena oil. 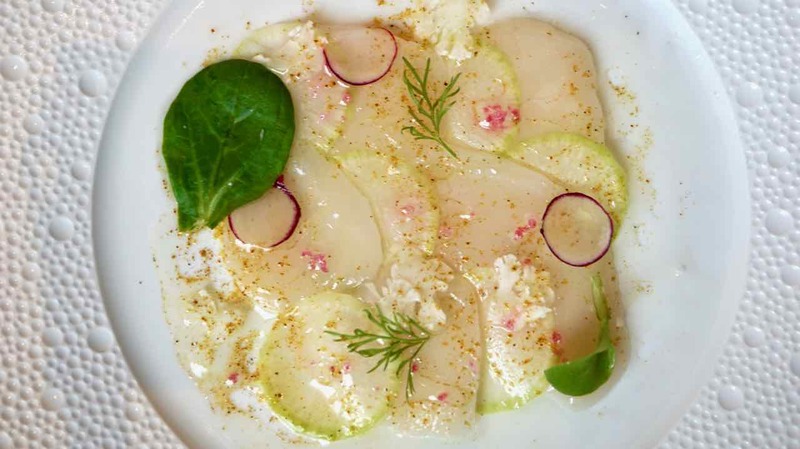 On a beautiful plate, that I recall having see before somewhere, thin slices of raw scallop are arranged, layered with thin slices of radish. I can see why Alain has paired these two ingredients together, visually they both possess a beautiful translucent quality and each a delicate flavour that compliments without overpowering the other. Their is a very slight back note of curry and the verbena oil is very clever way of adding a soft herbaceous citrus scent. Now our first red meat dish and without doubt the best beef tartare I have ever eaten. The beef is from near Mont Saint Michel Bay where Alain’s latest organic garden and orchard is situated. 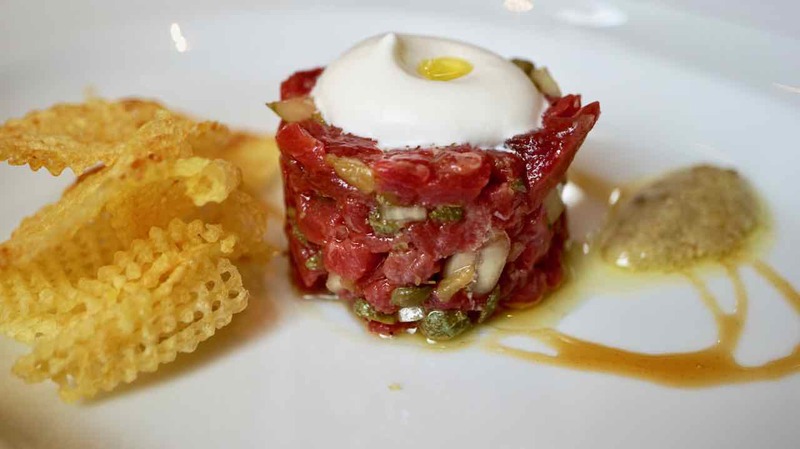 The tartare is topped with a dollop of white horseradish cream indented in the centre and filled with olive oil, visually reminiscent of an egg. The beef has been meticulously cared for in its preparation, there is not a single sinew and sliced to just the right size for the perfect eating experience. Seasoned beautifully and with a few zingy capers in the mix it is just wonderful. On the side a little anchovy sauce for an added touch of salty punch to accentuate the beef. And potatoes, thin latticed fried potatoes, my happy food. Monkfish has made it to the list of thirteen of the ugliest animals on the planet. It’s big, its creepy and it’s definitely ugly. Shout out to the first guy who thought “yum that looks tasty!” Cause he was spot on. 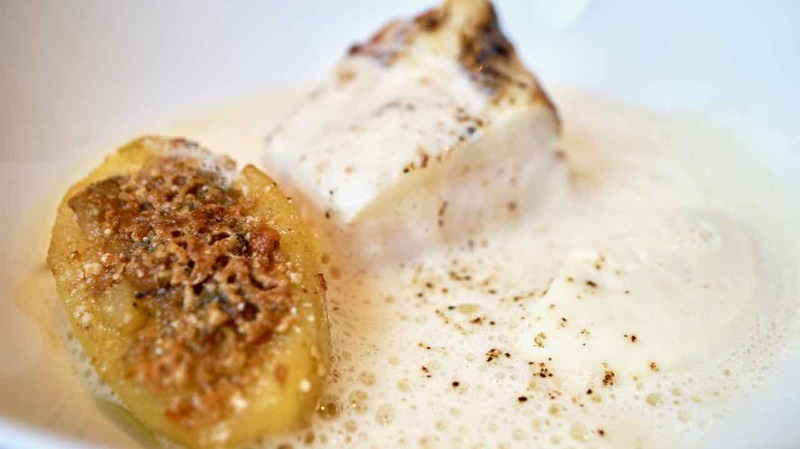 Alain has prepared a generous portion of this firm, sweet, white fish served with celeriac purée and a light foamy white wine sauce. What a beautiful transition from the beef. Mark Antony is back, this time with risotto he tells us, but there is no rice to be seen. 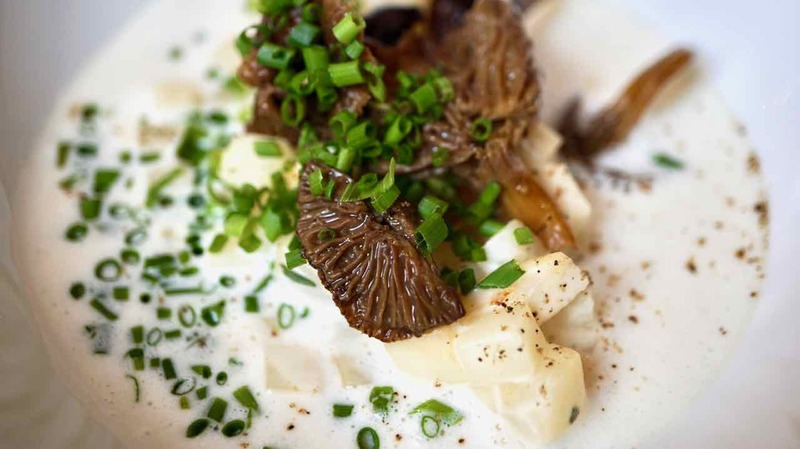 Instead a perfect dice of celeriac, adorned with wonderful chanterelle mushrooms and surrounded by a delicate creamy sauce. 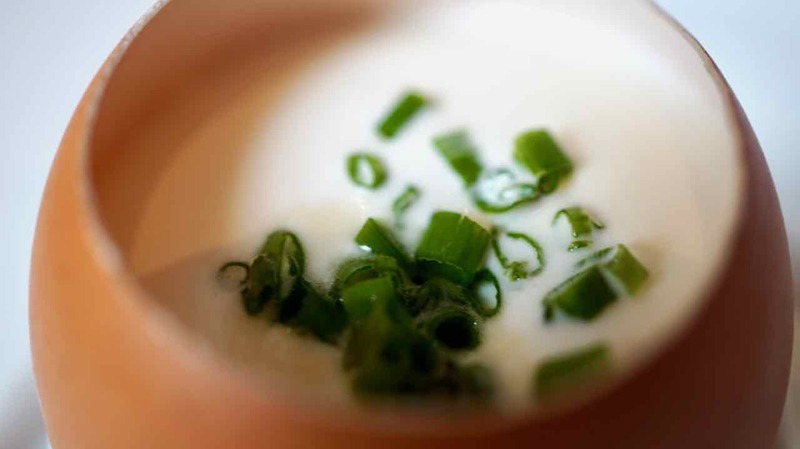 A pretty sprinkling of chives finishes a very clever dish. Here comes our little silver bowl again which we have come to associate with soupy things. This time Japanese inspired Gyoza, a crispy sided fried pork and coriander dumpling. 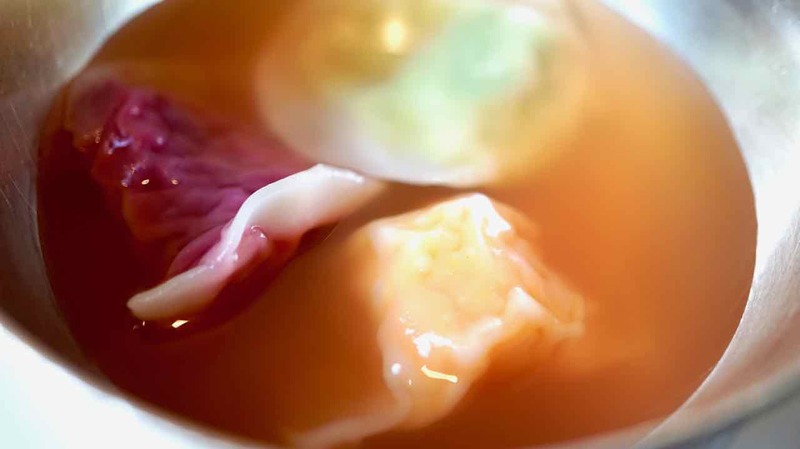 A gorgeously vibrant and fragrant broth is poured over the delicious little morsel making for a brilliant dish. Stuffed cabbage is a surprising dish. Firstly it is very dark green making me wonder what kind of cabbage it might be, perhaps kale or is it covered in spinach? I am a big lover of green leafy veg so this sounded exciting. The little tight ball of vegetables is full of robust flavour and the delicate Parmesan sauce is exceptional. ‘Potatoes cake’ is the English translation that Mark-Antony gives us for our next dish, I didn’t manage to quite note down the French but I think it might be ‘pâté aux pommes de terr’. 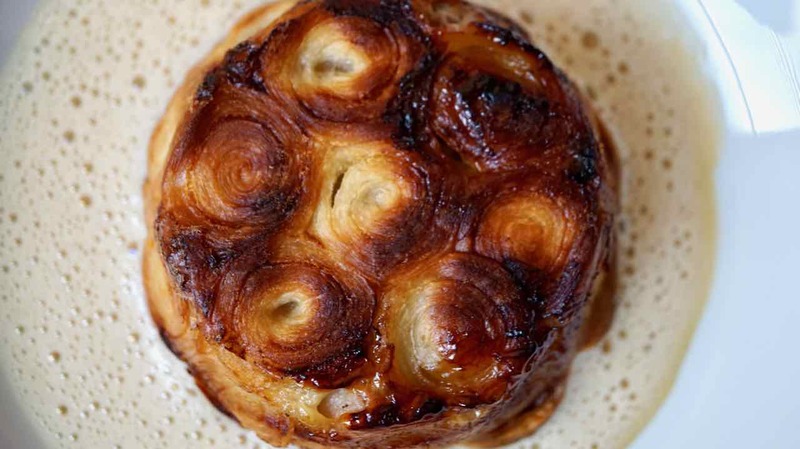 It is a beautifully presented little pie filled with an extraordinary filling of pork and foie gras. So when you hear potato pie don’t think shepherd’s pie, this one is French it has flavour – lots and lots of rich robust flavour. We know the savoury part of our meal has come to an end when a pretty tray of delicate sweet treats is put before us. The most delicate palmiers, tuiles, wafers, what looks like caramels and fudge wrapped in cellophane and a macaron topped with passion fruit filling and a crispy toffee top. And then desert plates begin to arrive. First Paris Brest, a lovely little pastry filled with a creamy almond filling. Apparently first created in the shape of a bicycle wheel to celebrate the Paris, Brest, Paris cycling race. 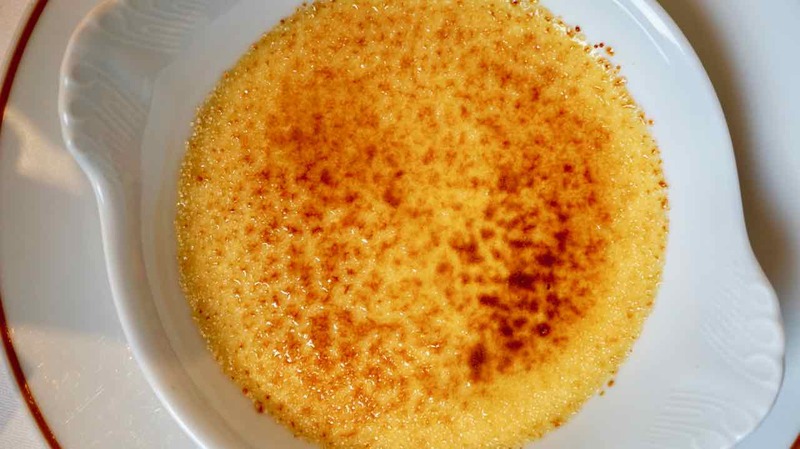 Alain’s version of this traditional dessert is light and delicious. Finally creme brûlée. But this is no ordinary dessert. It is a sage creme brûlée and oh my goodness I can’t even explain how amazing this plate is. Sage is such a distinctive pungent and bold herb It would never have occurred to me to use it in a sweet context. Here the cream infused with sage and then sprinkled with sugar to create thin delicate top is just incredible. 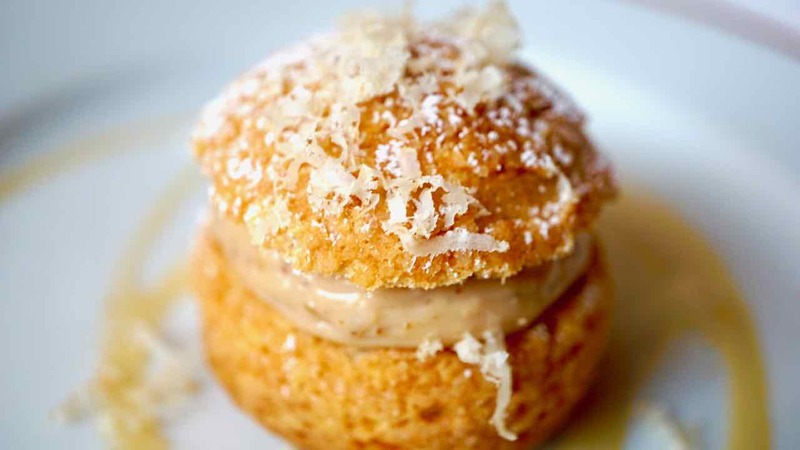 My dessert of the day and one I will definitely seek to recreate. Just when I thought it was all over and the day couldn’t get any better, Alain Passard bursts out of the kitchen into the dining room, full of energy, laughing, joking, with an aura a mile wide, he instantly fills the room. His joyful presence washes from one part of the restaurant to the next as he greets each guest personally, shaking hands and patting backs. Where there is a spare seat at the table he sits and chats. It’s pretty clear it’s mostly French people in for lunch today. When Alain gets to our table his joyfulness is absolutely palpable, with big sweeping gestures he shakes our hands, and we thank him profusely for an exquisite lunch. With his few words of English he is excited to tell us what a wonderful season he is having in the garden and how magnificent his produce is. He dips down for a final hug giving me a strong squeeze with an arm around me and strong hands on my shoulders. It’s so lovely to feel so genuinely welcomed. We order a cab and stand outside while we wait for it, taking a quite moment in the fresh air. There are a few other customers on a cigar break. Then suddenly Alain pops out the front door of the restaurant. Hands in the air with excitement he rushes up to us again, as thrilled to see us as I would be if my kids came home for Christmas. Arms outstretched he wraps each of us in a big demonstrative deep hug. He has been quoted as saying that his garden saved his life. This is definitely a man filled with life, he has clearly found his holy grail and knows how to be present, here and now and be joyous in the being. Part of the journey that has led me to be here today and to have sat at Alain Passard’s table has been about finally learning to live my truth and not a truth that someone else holds about who I should be or what I should do. I leave today deeply moved and inspired, inspired about food, inspired about vegetables but mostly inspired about living a truly centred and authentic life. Thank you Alain for a truly memorable day and thank you my love for continuing to open the doors and gently nudge me through them.